Free Shipping Included! 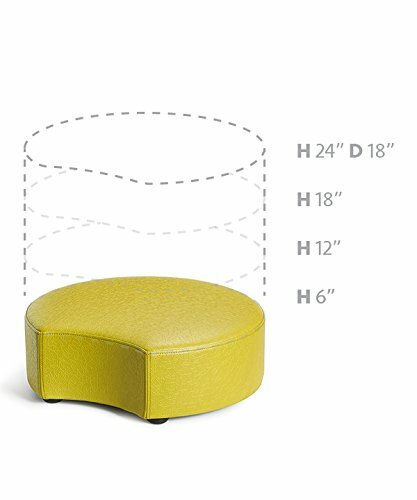 Logic Furniture MOONCZT12 Moon 2 Crescent Ottoman, 12'', Zest by Logic Furniture at Indsight. MPN: MOONCZT12. Hurry! Limited time offer. Offer valid only while supplies last. Crescent moon is a cylinder with a spliced taken from the side, that allows this piece to nest up nicely with the new moon complete cylinder ottoman. Crescent moon is a cylinder with a spliced taken from the side, that allows this piece to nest up nicely with the new moon complete cylinder ottoman. These versatile pieces can be arranged as a Group or can be pulled apart to stand alone. This ottoman includes black ½” nylon glides that allows for ease of use in a highly traffic commercial or residential space. four Height options offer versatility. Fully upholstered in cf Stinson impress with sta-kleen- inks & stain resistant. This sta-kleen technology makes this seat resistant to soils, stains, inks, heavy duty abrasion, fluids, bleach-solution and fading. Manufactured in Goshen, Indiana, USA.